How many of you have heard things such as this? Of course, all of you! There are so many fad diets and pill solutions out there, it could make one’s head spin! I’ve tried a lot of these diets over the years, including Atkins, South Beach, The Zone, etc. The only two that have truly worked for me were SlimGenics and Weight Watchers. Even so, like so many others, I’ve struggled to maintain long-term weight loss. Over the years, I’ve seen countless commercials for weight loss pills, drops, powders you just shake onto your food and you miraculously lose weight, diets that promise to drop the pounds with virtually no effort from us (even chocolate diets!). But, they all seem to have one main theme in common: they all work in conjunction with diet and exercise. So over the years, I’ve let this advertising and hype simply pass me by. I know there is no quick fix; there is no miracle. You know how I know this? Because there are still very rich, glamorous Hollywood stars who are very overweight. Do you think for one second that if there really were some miracle drug to make us all thin that these very rich and powerful people, whose very careers often depend on remaining beautiful, wouldn’t ALL be thin? We wouldn’t watch them yo-yo, just like us. If the miracle is out there, they’re going to find it first! So, when a book called “The Metabolism Miracle” first came into my radar, I ignored it. I honestly don’t even remember under what context I saw it, but the sensationalized title itself told me it was just the next fad; here today and gone tomorrow. Occasionally, this book would continue to cross my path, but I continued to dismiss even the notion of seeing what it was all about. Until this week. I received an email from NBC’s The Biggest Loser about this book. Now, I don’t generally receive emails from them promoting fad diets or products – they stand firm in promoting healthy eating and an active lifestyle. So, I decided to at least see what this book was about. My curiosity was officially piqued. Turns out, this book from Prevention Magazine is actually not about a miracle at all (I reserve those for God, thank you very much). I believe the title is unfortunate, because it made me believe it was another “we can fix you and you don’t have to do any work at all” fad, but it’s not. 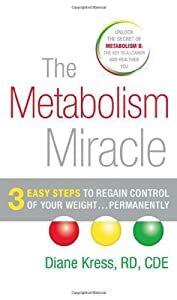 The basic gist of the book is as follows: about 1/2 of the population has metabolism that is “broken” (this author calls it “Metabolism B”, but it’s often referred to as insulin-resistance, hypoglycemia, etc.). That is, their bodies do not properly process carbohydrates – they over-release insulin when carbohydrates are consumed, leading to a self-destructive cycle of continued over-carb consumption and carb cravings that are virtually uncontrollable. While there is no way for me to break down this book one simple blog post, I found the concept interesting enough (and the reviews positive enough) to obtain the Kindle version from Amazon.com. I’m about 1/2-way through it, and I’m going to give it a try. The book promises NOTHING without a lot of hard work and, in fact, requires a minimum of a 4-month commitment. Not only will my diet be radically changed (temporarily), exercise is crucial to success and the plan requires a minimum of 30 minutes a day, 5 days a week. This is not something that will be particularly easy, but if there’s even a chance that what it promotes is possible, it’s worth the effort. And the bonus? I WILL lose weight with this diet and exercise plan, even if it doesn’t fix me forever, as it claims is possible. What exactly does this book claim, you might ask? Well, it claims that if you’re intentional about it, you can actually re-program your metabolism (by dealing specifically with the short-comings of your pancreas and liver) over a period of time, allowing your body to function as it was intended when carbs are consumed. Of course, the book requires a commitment to fairly healthy and smart eating. Once your goal weight is achieved, you should never go back to pigging out on carbs and eating fast-food on a regular basis, as it can easily throw your body out of whack (if you’re one of the unfortunate plagued with Metabolism B, that is). Of course, eating like that is foolish for anyone; this is something I already know. But apparently, it’s worse for some than others. Do I have Metabolism B? Well, only blood tests can tell me for sure. However, there are a series of questions that are asked to help determine it and I believe there is strong evidence to support that I might. Best case scenario? I not only lose weight and learn the best eating patterns for my body, but it actually helps to correct some of the damage done to my body and assists me in maintaining long-term weight loss. Worst case scenario? I lose weight and learn some helpful eating patterns for my body. Nothing in my body is “fixed”, but with a healthy diet and exercise, I can find balance anyway. So, what about you? Anyone else heard of this book? Had any personal experience with it? Know anyone else who has? I would love to hear your thoughts! Happy Easter everyone. He is risen and we have life because of it! I also read this book and was very skeptical at first too. 🙂 I still think it’s a little bit “broad-brushed”, but I did learn a lot from it! I did the 8 week strict low-carb diet the book recommends and it really helped me a lot! It was tough at first, but then it wasn’t too bad. I felt like this diet finally allowed my body to lose weight! Before I tried the low-carb thing I felt like it was very hard for me to lose weight. I felt bloated and sluggish a lot of the time. This really really helped with that and I would recommend it to anyone. I also tried a lot of the recipes in this book and they were all great! There are some great muffin recipes in there and I replaced the soy flour with almond flour to make it more legal. They were really yummy. You can check out my experience on my blog if you like, http://www.healthyhappymel.wordpress.com Just type in “Metabolism Miracle” in my search box and you’ll see some posts about it. I think you’ll really love it. It taught me a lot about myself. I was scared of the whole “low carb” thing for a long time (I love carbs and treats! ), but this diet proved to me that I can do it! Feel free to ask me anything, anytime! I have no Miracle, just a long hard road. My Blog is my continued journey of eating as well as I can trying to keep weight off and stay healthy. I have never written a book before until now and this is my first. It is about my journey to losing 100 lbs. and what I did wrong and right. It was the hardest thing I ever done and it took me 1 1/2 years. It’s not all about diet, its about changing your life. I hope those you you trying to lose weight or have diabeites can learn from this and that is why I wrote it. Thank you – I will definitely check it out. I agree with you 100% – there is NO miracle. It is only hard work that will get you where you want to be and if you don’t change your life, you’ll never stay there (this is where I still need to learn and improve).